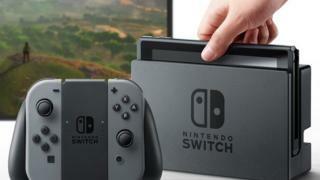 Thousands of owners of Nintendo's new console, Switch, have complained about dead or stuck pixels creating distracting and annoying dark squares on their screens. Nintendo said such pixels were "normal and should not be considered a defect". But one analyst said if the issues were as bad as online photos suggested, it was "unbelievable" Nintendo had let them leave the factory. The £280 handheld console went on sale on Friday. Sales figures suggest it has become the fastest-selling games console in the Japanese company's history, with reports some shops have already sold out. In the UK, it has sold an estimated 80,000 units. The Switch can be played both on televisions and as a standalone device. It launched with a handful of games, with some critics saying there were too few. And now, thousands of customers have reported their new devices came with a screen problem. On a Reddit discussion thread, one user said: "I understand they're apparently common in devices, but in a handheld system it's a big enough annoyance for me I would not purchase a device with one." He said he had a similar problem with his Sony Playstation Portable. "My first one had dead pixels in the middle of the screen, and I brought it back to the store I purchased it in," he said. "Luckily, it was a big news story so they were allowing you to open up new boxes in the stores and turn on the device. "I went through three and on the fourth got one without any visible dead pixels." Nintendo's support page states that: "Small numbers of stuck or dead pixels are a characteristic of LCD screens." A similar pixel issue also affected Nintendo's DS, and the Japanese gaming company eventually allowed buyers to replace devices. Paul Gray, an analyst at research company IHS, said such issues should no longer be common. "In the early days of LCD screens there were lots of defects, but these days you see fewer and fewer of them," he said. "Some of the photos I've seen posted online, I cannot believe that Nintendo would have knowingly let them leave the factory like that. "Something doesn't ring quite true," he said, suggesting that some of the photos may have been doctored. Mr Gray advised anyone with a defective device to return it to the shop they bought it from. "If you are a consumer and you find it irritating, you should go back to the retailer and say that you are not happy," he said.